Oh you guys do I have a treat for you! If you’re into Indian desserts, booze, and coffee then this Spiked Frappuccino is HEAVEN!!! SomPriya sent me a box with their delicious (and gorgeous) liqueurs that are great to sip on after dinner OR mix into a whole slew of things. 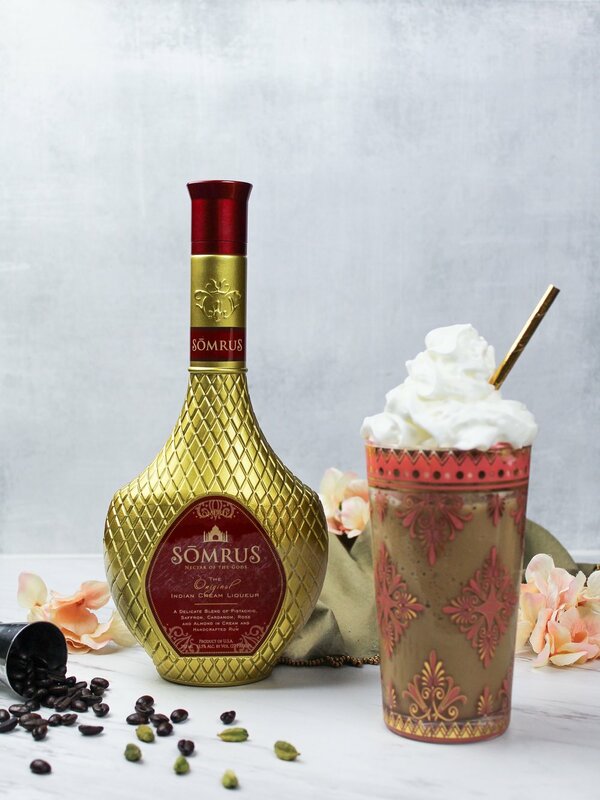 We actually have been huge fans of SomruS for over two years, but that was way before my blogging days, and now I get to tell you about it! They’ve captured the ingredients used to make kulfi (a frozen Indian treat) in the original recipe and they also have a mango flavor…I know holy moly! So you can infuse rose, saffron, cardamom, and pistachio flavors into your cocktails and even your food! These blended coffees are perfect for a weekend brunch. Blend ingredients together and serve immediately! Garnish with sweet rose syrup and whipped cream if desired.